Unless you have a camera that does it for you, panoramas don’t merge themselves. Specialized software, like Photoshop Elements, combines (stitches) the separate frames of the panorama into a single blended image. Photoshop Elements 11 for Windows has Photomerge. Photoshop has a similar capability (coincidentally, also named Photomerge — maybe the lawyers should look into that). If you make any changes, make the same ones across all frames of the panorama. Double-check the white balance and see if there are any blown highlights. JPEGs from the camera load directly into Elements and you don’t have to convert them. You can then start working immediately on your panorama. Raw must be converted to JPEGs or 8-bit TIFFs first. This process is just like converting raw photos for HDR. 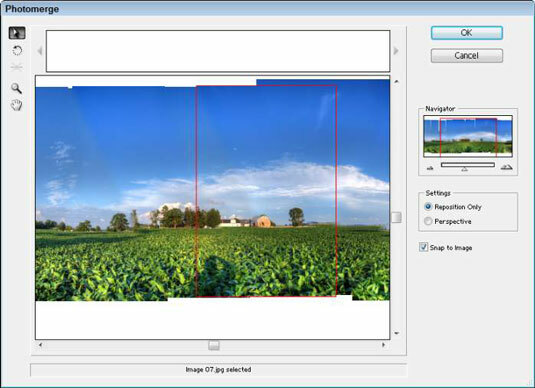 Open Photoshop Elements, choose Photo Editor, and choose Expert mode. Choose Enhance → Photomerge → Photomerge Panorama. 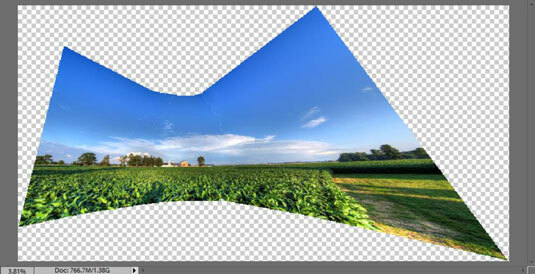 The Photomerge dialog box appears, beckoning you toward panoramic greatness. Find the folder that has the frames of the panorama. Select them and click OK. 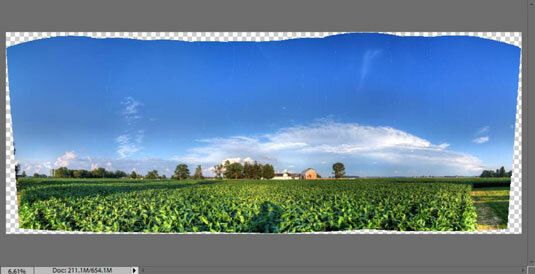 The Open dialog box closes, and the selected files appear in a new, untitled image document as a stitched panorama. Alternatively, you can open the frames in Elements first, then press Add Open Files when you get to this point. Auto: You’re telling Elements to go for it, allowing it to choose between Perspective and Cylindrical layouts. Perspective: The center of the panorama doesn’t change, and outer areas are distorted so horizontal lines parallel to the ground stay that way. The bowtie effect might happen with this choice; the center of the panorama looks normal but the corners are heavily distorted. You lose this area when you crop the final image. Usually, Perspective is the least attractive option. Cylindrical: This option eliminates the bowtie effect on the corners. In fact, the corners do the opposite — they creep in. Sometimes, the sky bulges upward in the center of the image more than you see here. Everything that isn’t a nice, tidy rectangle is cropped out at the end. Spherical: This option pinches the panorama inward and curves it as if it were taken from a globe. Collage: Throw everything together and align it. The software rotates and scales any layers, unlike the Perspective layout. Reposition: This layout aligns each frame (based again on matching reference points) but doesn’t transform them in any way. The Reposition Only option can produce good-looking panoramas that don’t suffer from undue amounts of distortion. Interactive Layout: Elements opens a lightbox with your stitched panorama (the images it can do so automatically, at any rate) and gives you the control to override the existing layout. (Optional) Zoom in and out, click and drag frames to reposition them, rotate individual frames, and change the settings. If you select the Perspective radio button, you can set the photo’s vanishing point, which is where some parallel lines in the photo appear to point to. Elements aligns and processes the images and eventually creates the panorama as a new image. Each frame occupies a separate layer, with portions masked (hidden) to blend together well. Select Yes if you want Elements to fill the transparent edges of the image. It pulls additional imagery in from individual panorama frames so that you don’t have to crop later. 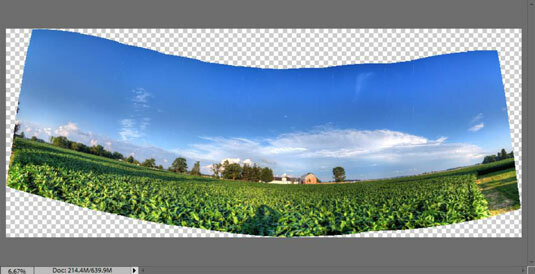 The result is a physically complete panorama layer positioned at the top of the new file. The individual frames are on separate layers beneath it. Cleaning the edges may not work, however, if you don’t have enough memory on your computer. The panorama may have too many photos or they could be too large. Select No if you want to do some blending and crop the image yourself. You don’t get a merged panorama layer in this case. Save the raw panorama as a Photoshop file .psd. The .psd is for future reference before you tweak frame blending and make other adjustments.